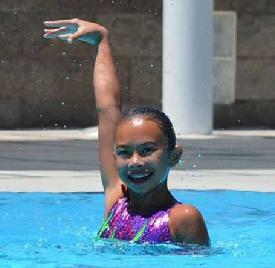 This program is designed for young athletes who are interested in incorporating their love of the water with dance, gymnastics and performance. Swimmers focus on the basics of synchronized swimming such as eggbeater, sculling, basic figures and body positions as well as a simple team routine. They practice approximately 1-2 days per week and participate in novice meets and our annual watershow. 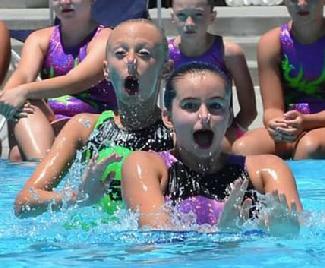 This program is for advancing athletes who love synchronized swimming and are serious about improving their skill level and want more performance opportunities but might not be ready or able to make the full commitment required for the competitive team. These athletes practice approximately 2-3 days per week and participate in local and regional competitions as well as our annual watershow. At this level, the athletic training and competition schedule is more rigorous. However, athletes develop strong bonds and friendships with their teammates and have a lot of fun together performing and practicing. Depending on team placement, these athletes practice 4-6 days per week and compete in local, regional and national meets. Additional strength and flexibility training is required, as well as acrobatic instruction to enhance lifts and presentation. Select athletes in this program also perform as entertainers at shows for local business events or other functions. 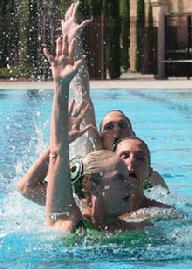 Our Masters Program is for strong swimmers who either have synchronized swimming experience or just want to try it. Participants should be 18 and older, be proficient in freestyle, backstroke and breaststroke, and most importantly, have a positive mental attitude and a strong desire to have fun. 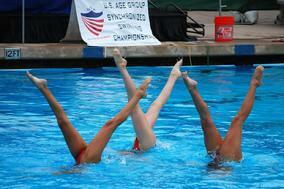 Masters swimmers learn synchronized swimming techniques, figures and presentation skills. Conditioning and flexibility training are included as part of our program. So grab a friend and head to the pool. The more swimmers, the more fun!